Average Height	: 15" - 20"
Average Weight	: 20 - 35 lbs. 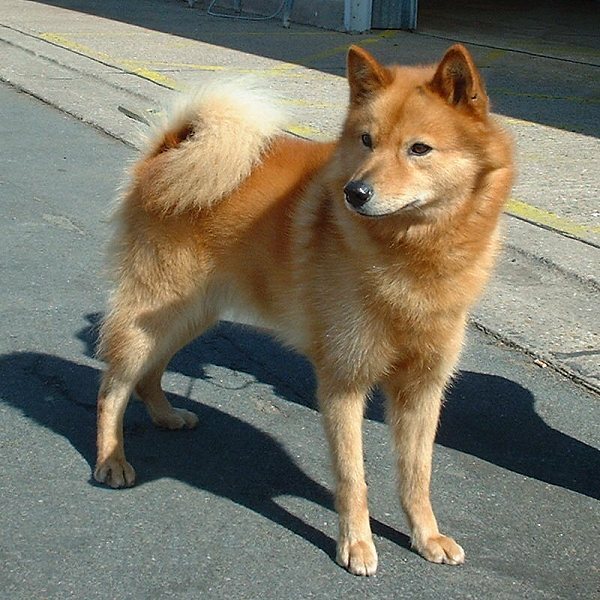 The Finnish Spitz has historically been brought over from the Volga River Area of Central Russia, and evolved from the hunting tribes of Finland over 2000 years ago. It has become the national dog of Finland, and has often been mentioned in several Finnish patriotic songs. They were used to hunt small game ~ a great bird dog ~ a great retriever. The breed is widely known throughout Scandinavian countries, and it was first recognized by the AKC in 1987. The first Finnih Sptizes were thoroughly inbred during the 1880s, and the first English Spitzes arrived in England in 1927. These dogs make excellent family pets and have also been found to be good estate dogs. They are also excellent at maintaining careful watch over families and small children. Astute, swift, and intelligent, these dogs display many fox-like mannerisms. It is important that they are trained appropriately and managed with care; they have long been bred with an aggressive streak and have a tendency to fall into overly aggressive patterns as a result of their heritage. When the dog would find their prey they would alert the hunter with their distinctive yodel type, ringing bark, pointing with their head in the direction the animal was in. The breed is more popular in Scandinavian countries and less popular in the USA, most likely due to their reputation of using their bark to alert their masters. A healthy and well-bred dog, the Finnish Spitz is handsome in appearance and strong as a leader. A natural hard worker, the Finnish Spitz trots and walks with a lively grace, and has a natural affinity for speed. Always active and overtly friendly, these dogs are brave but also very cautious. They are fox-like in both manner and action, and they have a tendency toward unprovoked aggression. The Finnish Spitz is brave, lively, and always alert; it is attentive as well, and will listen to commands and direction from its master. Patience is required during obedience training, as this dog can become difficult to manage at various periods of time. These dogs make great companions, and are pleasant to be aroudn with family members of all ages. They are especially good with children and older adults, and although they are slow to mature, they have a friendly manner to them. The male versions of this breed can be exceptionally domineering and very aggressive. This is a natural trait that can be changed with the appropriate training and handling, and the female versions are also somewhat stronger than other breeds. However, these dogs may also be reserved and aloof with strangers, and they are generally good with other pets as well. This is a dog that requires a lot of patience and understanding as it can become quite stubborn if it feels threatened. Using a consistent manner and formal training procedures can help make training more effective and successful; after a short period of time, these dogs will naturally bond with their owners and can perform skills and tricks quite well as a result. The Finnish Spitz will bond positively with strangers and does not have a tendency to attack. However, they are also known as the 'barking bird dog' in Finland because of their unique bark and tone. They have been known to bark in a chirrup-style manner that can become irritating if it is unrestrained. These dogs have been bred for many centuries to emphasize their barking behaviors, and this is a distinct quality of their vocalization abilities. If the dog's barking becomes a problem, it can become difficult to control. These dogs tend to fall into a barking habit when they are left outside alone for extended periods of time, or when they become restless and bored. These dogs have a strong stamina and endurance, and will fare well with a variety of activities. They are built for high performance, and will work up a strong routine in a very short period of time. Naturally intelligent and curious, these dogs make wonderful pets for families of all ages and backgrounds. They are strong protectors, and bond well with their owners consistently. The Finnish Spitz has a self-cleaning coat since it is considered to be an Arctic dog. This requires little maintenance overall, but regular grooming with a brush and comb is important to remove dead hair. The coat does not have a strong odor, and the dog is a seasonal heavy shedder. Their rich coat can stay lustrous and thick year round, and the dog will enjoy regular care and maintenance. The Finnish Spitz requires extended amounts of exercise and will need to be taken outdoors at least once per day, ideally twice per day. The dog is intelligent enough to pick up new skills and tricks on a regular basis, and will happily engage in new activities. Taking the dog to the park or other open spaces is ideal for making sure it receives the appropriate amount of exercise. Jogging and running with their owners is another wonderful opportunity for bonding, and these dogs fare well with frequent intensive exercise sessions. Playing fetch or using a Frisbee are additional activities that offer appropriate exercise for this dog, and even swimming can be valuable to them. This dog is quite independent, and will come up with its own activities if it is bored or restless. It is important to train them during regular exercise sessions, and two walks per day should suffice. These dogs enjoy cooler climates and outdoor walks during the wintertime work well for them. These dogs are natural hunters, and will use their noses and scent capabilities to take part in different activities outside. It's important to keep them on a leash, as they do have a high energy level and may wander. They can be very well trained to pick up scents, and have a natural ability to hunt and discover. They will attack with swiftness and ease, and it is important to remember this when developing in effective training program. The Finnish Spitz is a very smart, astute, confident, and intelligent breed. It learns new skills very quickly and they are easy to train with the appropriate amount of attention and care. These dogs are not difficult to train but they can become stubborn if they are overly anxious or fearful. It is important to work with them in a relaxed manner whenever possible. These dogs are willful and bold, and will perform at a high level once they are comfortable and have respect for their owners. These dogs are impressive hunters, racers, and rescuers and can be trained from a very early age. They are sensitive to cues and owner demands, and will perform tricks as needed. Firmness and consistency are important for these dogs, and the best type of training is both motivational and playful. These dogs enjoy being outdoors and training them with 2-3 fifteen minute sessions per day is ideal. They are natural explorers, and taking them outside to new environments can also help improve their skills. It is important to remember that this dog has become famous as a 'barking hunting dog' and it can be a very valuable asset during hunting phases. If it finds itself in an unpleasant situation, it will bark excessively but this acts more as a warning and the dog rarely bites. This dog makes an excellent watchdog, and will become naturally protective of its family. It has a special love for children and a strong sense of duty towards its owners. Since the dog is exceptionally sensitive, it can pick up on harsh tones of owners and other any tension or bickering amongst family members as well. It is important to train these dogs with a positive tone and make sure they are addressed with firm and gentle voice. They respond well to touch but become too 'soft' without the appropriate control. Training needs to be brief and direct as these dogs are easily bored and may require ongoing obedience classes in conjunction with at-home training.